“No one expected it. In a world darkened by economic distress, political cynicism, cultural emptiness and personal hopelessness, it just happened. Suddenly dictatorship could be overthrown with the bare hands of the people, even if their hands had been bloodied by the sacrifice of those fallen. Financial magicians went from being the objects of public envy to the targets of universal contempt. Politicians became exposed as corrupt liars. Governments were denounced. Media were suspected. Trust vanished…[…. ]” (Castells, 2012: 1). Castells’ latest book engages with one of the most surprising and fascinating political issue of our times: with the sudden rise of mass uprising across the world, their political force, and momentum. Castells explores the variety and cultural diversity of these uprisings in an ambitious project. He considers the movements from Iceland and Tunisia, from the Egyptian Revolution to the Arab Spring, from the Indignadas movements in Spain to the Occupy movements in the States. For those who have missed the actual unravelling of these events, and for those who do not have a clear picture of what happened across the world in 2011, this is a timely and important book, as it provides a fresh and well written account of the key events affecting the different movements, as well as some important information on their cultural diversity and context specific struggles. In mapping the activities and practices of the different movements, the book addresses two fundamentals: What triggered the 2011 mass mobilisations across the world? How can we make sense of these new forms of political participation and action? According to Castells, the answer is simple: these movements began on the Internet social networks and spread by contagion in a world of wireless communication, mobile media and the viral exchange of images and content. He argues that the Internet has created a ‘space of autonomy’ for the exchange of information and the sharing of feelings of collective outrage and hope. He strongly believes that Internet networks have become the material support of a new type of political participation, a participation that is based on horizontal networks, on political autonomy, leaderless organisation, and groundless solidarity. His claims are powerful, his prose captivating and the examples he uses are fascinating. Yet the reader is left to question whether the examples discussed really support his assumptions on the role of the Internet in the mobilisation of political action and on the creation of new forms of political participation. If one considers closely the movements discussed in the book, he/she would realise that the issues at stake are far more complex than Castells wants us to believe. What emerges from his account is that Internet technologies played a role in the rapid mobilsation of people and coordination of action. Yet his data and examples used also suggest that, as many social movement scholars have pointed out, the relationship between social movements and new technologies is a matter of constant negotiation and is defined by a complex dialectics between transformation and continuity, between the technical and the social, and between old and new political repertoires of political action and media activism. What is most surprising about Castells’ book is its inability to address this complexity. 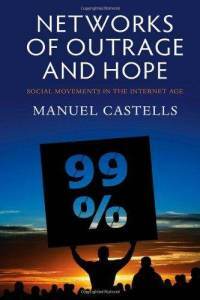 This is partly due to the fact that within his book Castells refuses to engage with key theoretical debates on social movements and new media technologies. In doing so he does not consider the contribution of those who have shown that in 2011 mobilisation occurred thanks to face-to-face interaction as well as to the social media buzz (Juris, 2012), that far from being ‘horizontal’ and ‘leaderless’ these movements often have their leaders and reference points (Gerbaudo, 2012), and that internet technologies are affecting political imagination and practices in contradictory and often problematic ways (Barassi and Treré, 2012; Mattoni, 2012; Cammaerts et al., 2012). Most worryingly, Castells seems to be committed to continue to promote a type of techno determinism that refuses to engage with a more nuanced understanding of the Internet in everyday life. Castells’ techno-determinism is prevalent at both theoretical and empirical levels. At the theoretical level, Castells argues that the Internet needs to be understood as an autonomous space of communication beyond the control of governments and corporations (2012:2), and he overlooks the works of those who have highlighted the bound connections between political control and new technologies (Morozov, 2011: Curran et al, 2012) or the ones of those who emphasised the corporate nature of much of today’s Web 2.0 platforms (Terranova, 2000; Andrejevic, 2007; Fuchs, 2008). For Castells the Internet is an autonomous space of communication because it facilitates a new type of “mass communication of the self” which is directly related to the development of social and political autonomy (2009:53-71; 2012:7). In contrast to Castells, I believe that, as mentioned elsewhere (Fenton and Barassi, 2011) in order to understand the political possibilities offered by Internet technologies we have to critically address the concept of participation, individuation and autonomy. Theoretically Castells’ argument is based on the assumption that on the Internet, individuals have a degree of communicative autonomy and that individual participation is the premise upon which all other political acts are based. Yet, in understanding the complex relationship between internet technologies and new forms of political participation, it is pivotal that we not only appreciate that communicative autonomy does not necessarily translate into social and political autonomy, but that we also realise that the self-centred nature of social media often challenges the collective creativity of movements and political organisations. In addition to that we need to be aware of the fact that whilst it is true that web developments have accelerated the possibility to share information, and mobilise action in fast and effective ways; the pace of information exchange reduces political discussions and creates insurgent networks of action, which rely on weak networks and affinities, and not on shared political projects (Barassi, 2009). These transformations are having a strong impact on the lived experience of political activism with often negative consequences on processes of political transformation and social change. Theoretically, therefore, Networks of Outrage and Hope: Social movements in the Internet Age, seems to be grounded on a form of techno-determinism that overshadows rather than illuminates the social complexities involved in the use of internet technologies for collective action. This techno-determinism, as mentioned above, is not only present at the theoretical level, but also at the empirical level. In fact, as Fuchs (2012) has argued, Castells’ book is based on the assumption that there is a linear connection between political information on the Internet, the change in collective consciousness and the rise of political protests. Yet the reader is left to question where the evidence of his claims is. In actual fact, throughout the book Castells oversimplifies the emotional complexities of the movements studied and contends that within all the countries discussed the Internet has enabled the sharing of two forms of feelings, outrage and hope, which have played a pivotal role in triggering mass uprisings. Whilst it is undeniable that the movements of 2011 were triggered by a strong emotional and subjective dimension, we must be aware of the fact that they had also a strong material dimension. Furthermore, we must critically question Castells’ claim that the internet played a central role in the spreading of emotional feelings of outrage and hope and this is especially true in countries such as Egypt where, in December, 2011, only 26.4% of the population had access to the Internet (Fuchs, 2012:782). Therefore, at the empirical level, Castells’ work is techno-deterministic, because it’s based on assumptions on the pervasiveness and agency of internet technologies, which are not supported by an in depth understanding of activists’ everyday media practices and beliefs. Castells techno-determinism at both theoretical and methodological level reminds us that, at present, much work is needed to ensure that we reach a thorough and nuanced understanding of the complex relationship between Internet technologies and new forms of political participation. There is no doubt that these networked forms of communication have often become the material support of new types of political imagination and association (Juris, 2008, 2012; Barassi, 2009). Yet, to understand the way in which these new political imaginations are re-defining the terrain for political action, it is important to explore the complex dialectics between transformation and continuity, rather than emphasising disruption and novelty. It is only by looking at continuity that scholars can understand the complex and imaginative negotiations that enable activists to re-imagine social change in order to adapt to the techno-historical transformations of the last years. Veronica Barassi is Lecturer in Media and Communications and Convenor of the BA Anthropology and Media program in the Department of Media and Communications at Goldsmiths University of London. A trained anthropologist; her research interests cover alternative media and social movements, anthropology of media, online ethnography, Web 2.0 and Web 3.0; media rituals, media as practice, and the anthropology of representation. Her work has been published on New Media and Society, Communication Review,Social Movements Studies and Global Media and Communication Journal. At present, two chapters of her forthcoming book The Web and Everyday Critique: Activists Struggle against Digital Capitalism are under review by Routledge. Andrejevic, M. (2005) The Work of Watching One Another: Lateral, Surveillance, Risk and Governance. Surveillance and Society ‘People Watching People Issue’ (ed. Wood) 2(4), 479-497. Barassi V(2009) Mediting Political Action: Internet related Beliefs and Frustrations amongst International Solidarity campaigns in Britain, in The Humanities in the Digital Era, issue 11 (Retrieved on 27/02/2013). Barassi V. and Trere’, E. (2012) ‘Does Web 3.0 follow Web 2.0? Deconstructing Theoretical Assumptions through Practice’, in New Media and Society, Vol 14 (8):1269-1285. Cammaerts et al. (Eds) (2012) Mediation and Protest Movements, Intellect. Castells, M. (1997) The Power of Identity, Cambridge Massachusetts: Blackwell. Castells, M. (2009) Communication Power, New York, USA: Oxford University Press. Castells, M. (2012) Networks of Outrage and Hope: Social Movements in the Internet Age, Polity Press. Couldry, N. (2004), ‘Theorizing Media as Practice’, Social Semiotics 14 (2):115-132. Curran, J., Fenton, N. and Freedman, D. (2012) Misunderstanding the Internet, London: Routledge. Fenton N. and Barassi V. (2011) ‘Alternative Media and Social Networking Sites: The Politics of Individuation and Political Participation’ in Communication Review 14 (3) : 179-196. Fuchs C (2008) Internet and Society: Social Theory in the Information Age. New York: Routledge. Fuchs C (2012) ‘Some Reflections on Manuel Castells’ Book Networks of Outrage and Hope: Social Movements in the Internet Age.’ Communication, Capitalism and Critique, Vol 10 (2). Retrieved from this link , on the 15th of December, 2012. Gerbaudo P. (2012) Tweets From the Streets: Social Media and Contemporary Activism, London: Pluto Press. Juris, Jeffrey S (2008) Networking Future: The Movements against Corporate Globalization, Durham: Duke University Press. Juris, Jeff (2012) ‘Reflections on #Occupy Everywhere: Social Media, Public Space, and Emerging Logics of Aggregation’, American Ethnologist 39(2): 259-79. Mattoni A. (2012) Media Practices and Protest Politics: How Precarious Workers Mobilise, Ashgate. Morozov, E. (2011) The Net Delusion: How not to Liberate the World, Penguin Books. Orlikowski, W. J. (2000) ‘Using Technologies and Constituting Structures: A Practice Lens for Studying Technology in Organisation’ Organization Science 11 (4): 404-428. Terranova, T. (2000). “Free labor: Producing culture for the digital economy.” Social Text 18(2 63): 33.